UFO SIGHTINGS DAILY: Pilot Takes Close Up Photo Of UFO Over Luxembourg On Dec 2015, Photos, UFO Sighting News. 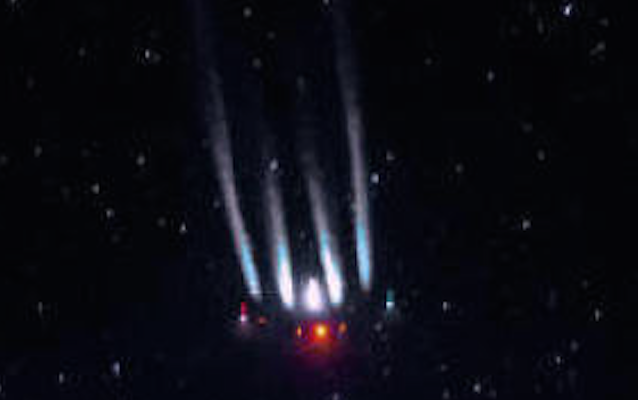 Pilot Takes Close Up Photo Of UFO Over Luxembourg On Dec 2015, Photos, UFO Sighting News. This UFO was caught by a pilot over Luxembourg. He saw the UFO and took a photo, which is confusing since he believes its an Airbus A380, but if it was that close to his plane, he would have been told to keep an eye out by the control tower, but not radar or control tower info came. Its a UFO, plain and simple, but pilots are fighting that if they say the truth, they could lose their career and be seen as an unfit pilot. Christiaan van Heijst Dutch pilot is use to browsing the sky on behalf of the company Cargolux. In addition, the 32-year-old man is an amateur photographer. Recently, he took out his camera at the time when he saw something flying, a strange object in the sky. The photo gives the impression that its a UFO. This unusual picture may not be a UFO, but may be an Airbus A380. The super-jumbo flying 300 m above the plane of Christiaan van Heijst, somewhere over Africa. "I could almost distinguish the color of hostesses Nail Polish", indicates the pilot on his Facebook page. This may be an optical effect due to the speed and lighting of the camera that gives the impression of dealing with a spaceship, but it may be a real UFO.